Turkey became the bird of choice as it is bigger and can feed many people at once. The original Thanksgiving feast consisted of seafood and wild fowl. The bird eventually became so popular that Franklin Roosevelt tried to make it the national bird, but somewhere along the way, the bald eagle won out. 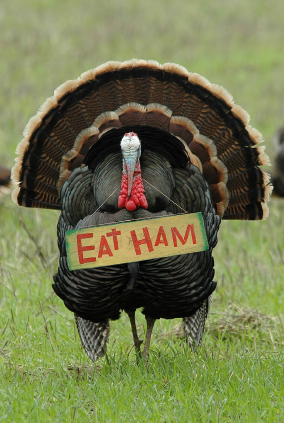 Myth has it that in 1947, the National Turkey Federation presented a turkey to President Harry Truman and that Truman presidentially pardoned the turkey from being eaten at Thanksgiving. The story goes that photos of the President, the turkey, and its temporary reprieve won over the public and became tradition. The Truman Library states that there is no evidence of this having occurred. Ronald Regan jokingly stated, when answering questions about potential pardons for Oliver North, that he’d have pardoned the turkey had he not known he was going to a petting zoo. Later, in 1989, President H. W. Bush, when presented with a turkey for the First Family, declared the turkey “pardoned” so that he could live out his days on a farm. It was he who made this a holiday kick-off tradition. In order to have a Presidential turkey selection, one family each year is granted the honor of raising and presenting two turkeys that they deem Presidential material. The turkeys are taught how to be around people, treated as pets essentially, and are routinely checked to see if they exhibit calm demeanor around others. For example, if they spook easily, that turkey will be eliminated. Ladies, we get pardoned on this one as well, as these turkeys are normally, not always,“Toms” meaning only the fattest, fittest males are bred and selected. This year’s turkeys will come from Minnesota. The “chosen ones” will be treated like a visiting head of state. They generally fly first class, are driven in a van equipped with a special turkey pen, stay in a secret luxury hotel, have guards and police escorts assigned to them, and often make their official debut, arriving in carriages to ceremonial trumpet fanfare. Each year, there is a National Turkey and an Alternate National Turkey (in the event of turkey assassination, illness or the chosen one’s failure to uphold his duties) that are spared the traditional dinner and allowed to live on farms and petting zoos. This year the Pardon will take place on November 23 at which time The White House will announce the names of both turkeys on the day of the Rose Garden ceremony. Katie and Zack, Stars and Stripes, Biscuits and Gravy, Marshmallow and Yam, Flyer and Fryer, May and Flower, Pumpkin and Vice, Courage and Carolina, Apple and Cider. This year, the National Turkey Federation chose four FFA (Future Farmers of America) students from a Minnesota High School to take over many of the responsibilities for the Presidential Flock. The teens spent time with the birds, taught them how to stand on a table, exposed them to camera light flashes and noise and gave them lots of attention to ensure that they are indeed “Presidential” material. The students also toured Minnesota schools with some of the Presidential birds that they helped to raise. They will be special guests at the ceremony in Washington, D.C.
Until 2004, the spared turkeys were sent to a farm in Virginia called Frying Pan Park – pretty scary stuff for a turkey who just had their life spared. From 2005 – 2009, the turkeys were relocated to Thunder Ranch in Disneyland where they served as Honorary Grand Marshals of the Disney Thanksgiving Parade. In 2010, the fortunate fowls were assigned to George Washington’s Mount Vernon Estate in Virginia. Now about those names, what would you name this year’s pardoned turkeys? « Call For Private Lessons!